One of the challenges of plant problem diagnostics is that Nature is sometimes less tidy than we might wish. Pests do not confine their damage to plants one at a time, and also the different stages of an insect may cause different types of damage (symptoms). Oak shothole leafminer (Agromyza viridula) adult flies damage oak leaf buds with their ovipositors. The holes from this damage expand as the leaf expands, causing the characteristically parallel holes on either side of the unfolding leaf. Later larvae of this insect cause leaf-mining damage shown as browned areas in the above photo. 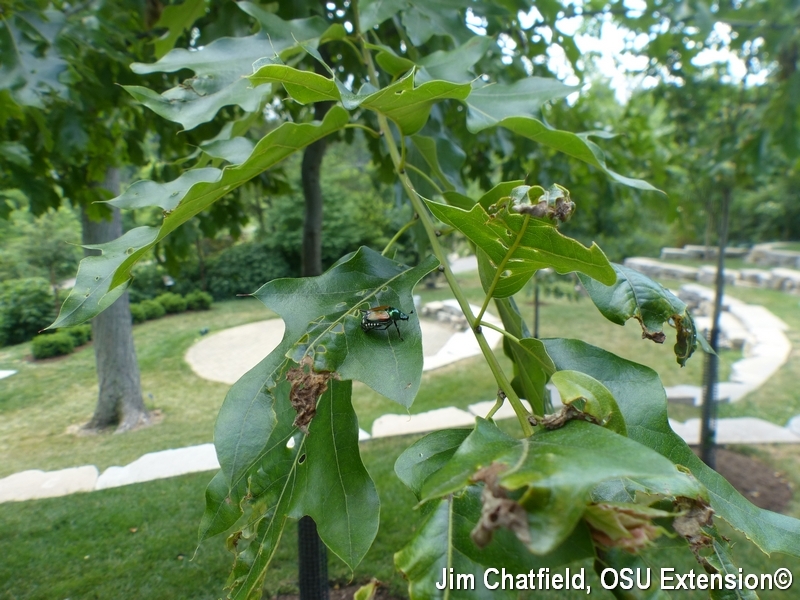 This does not, of course, stop a Japanese beetle (Popillia japonica) adult from later showing up on that same shothole leafminer-attacked oak leaf, possibly confusing the observer into thinking this beetle caused the observed damage. Japanese beetles, as Joe Boggs illustrated in his recent “Japanese Beetles Making a Comeback” byglalert (http://bygl.osu.edu/node/409) cause a different kind of damage to leaves, with their chewing mouthparts skeletonizing the leaves. Japanese beetles are also notorious for causing different kinds of damage with their different stages, as their larvae (grubworms) damage turfgrass and nursery crop roots.